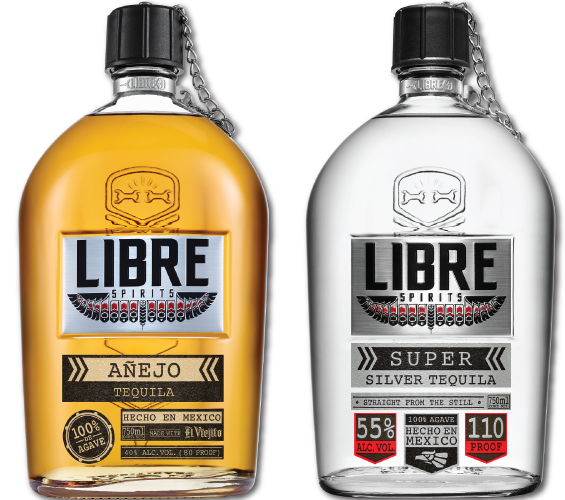 WE TOOK THE LIBERTY OF COMBINING THE HIGHEST QUALITY 100% WEBER BLUE AGAVE TEQUILA FROM ONE OF MEXICO'S OLDEST, MOST RESPECTED DISTILLERIES AND INFUSED IT WITH RADICAL NATURAL FLAVORS TO PRODUCE A TRULY NON-TRADITIONAL TEQUILA EXPERIENCE! 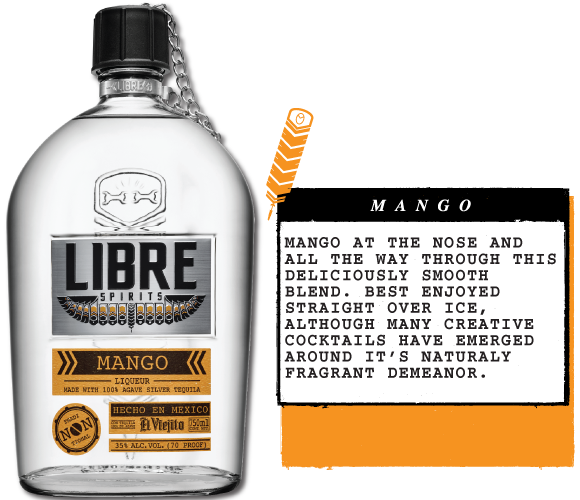 LIBRE LOOKS TO SHATTER PREVIOUS EXPECTATIONS OF WHAT YOUR TEQUILA EXPERIENCE "SHOULD" BE. WE'RE PROUD TO HAVE PARTNERED WITH TEQUILA EL VIEJITO TO PRODUCE OUR JUICE. ONE OF THE MOST RESPECTED DISTILLERIES IN THE REGION OF JALISCO, THEY HAVE ALMOST 80 YEARS OF EXPERIENCE PRODUCING THE HIGHEST QUALITY TEQUILA. EL VIEJITO HAS RECENTLY EXPANDED THEIR PRODUCTION CAPACITY BY ADDING 4 MORE BRICK OVENS. THIS ALLOWS US TO POTENTIALLY PRODUCE MORE THAN 500,000 CASES ANNUALLY WHEN NECESSARY WITHOUT ANY LOSS OF QUALITY. OUR PROUDEST MOMENTS ARE IN THE POSITIVE REACTIONS TO OUR ATTENTION TO DETAIL AND THE MERITS OF OUR PARTNER DISTILLERY IN ENSURING THAT NOT ONLY IS THE PROCESS OUTSTANDING IN QUALITY, BUT CLEAN AND ENVIRONMENTALLY UNCORRUPT. THIS IS THE 100% WEBER BLUE AGAVE BASE FROM WHICH ALL OF OUR FLAVOR OFFERINGS ARE CRAFTED. HARVESTED BY THE SAME FAMILIES WHO HAVE SUPPLIED OUR PARTNER DISTILLERY, EL VIEJITO, FOR THE LAST 70 YEARS, THE AGAVE IS HAND CUT (AXED, ACTUALLY) INTO QUARTERS AND SKILLFULLY LOADED INTO BRICK OVENS. NEVER COMPROMISING QUALITY FOR SO-CALLED "EFFICIANCY", MODERN AUTOCLAVES ARE NEVER USED FOR PRODUCTION. EVERY BATCH IS COOKED IN TRADITIONAL BRICK OVENS WHICH ALLOWS FOR THE BEST INTERPRETATION OF THE COVETED AGAVE SPIRIT. THIS IS THE BEAUTIFUL FOUNDATION OF TRADITION THAT LIBRE IS PRIVILEGED TO STAND ON TO BRING ABOUT OUR NON-TRADITIONAL EXPRESSIONS, RESPECTFULLY. WE WANTED ZERO QUESTION ABOUT OUR LEGITIMACY AS A TRUE TEQUILA BRAND. BEHOLD, AN AÑEJO WITH ABSOLUTELY NOTHING ADDED EXCEPT FOR TIME IN A WHITE OAK WHISKEY CASK FOR A YEAR AND A HALF. ROBUST, RICH IN TRUE AGAVE FLAVOR AND NOTES OF THE WELL PROCURED OAK THROUGHOUT. 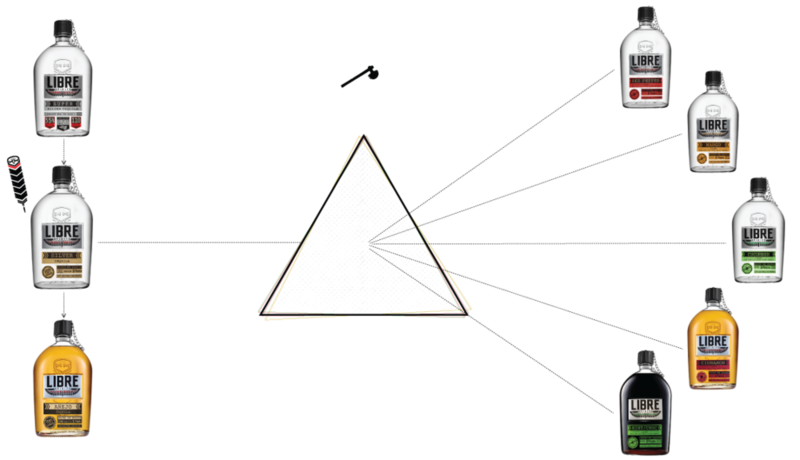 OUR PRODUCTION PROCESS IS SO CLEAN, SO DIRECT, THAT WE OFFER IT COMPLETELY RAW, AND UN-CUT. THERE ARE FEW TEQUILAS AT 110 PROOF THAT ARE TOLERABLE, LET ALON - PLEASUREABLE! THAT'S WHY WE COINED THE SUPER SILVER DENOMINATION, BECAUSE IT IS AND IT IS. STRAIGHT UP.